Having a dog that chews her bed can be incredibly frustrating, but it is a common problem that has practical solutions. 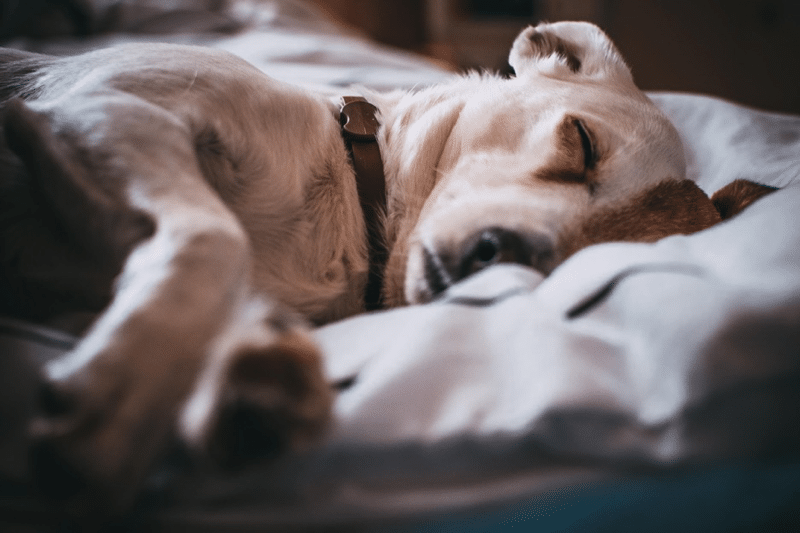 Along with understanding the causes of chewing and having a good positive training regiment, one of the most important steps in succeeding in curbing or preventing your dog’s bed chewing habit is choosing the best dog bed for chewers. The more difficult your dog’s bed is for her to chew or destroy, the more likely she will be to chew on approved chew items instead. Whether you have a known bed chewer, a puppy, or a newly adopted dog, you want to give her the best chance of success in her life with you. An indestructible bed makes it easier for you to train your dog the proper chewing etiquette, while an easily destroyed bed tempts your dog constantly, making training more difficult than it needs to be for you and for your dog. It seems so obvious– don’t destroy where you sleep, but many dogs have problems with chewing on their beds. Why? The ASPCA lists a number of reasons for dogs to chew their bedding, from separation anxiety to teething, hunger, or a suckling behavior. Chewing is a normal behavior in dogs, and the solution may be as simple as teaching your dog what is appropriate for chewing and what is not. Determining why your dog is chewing can help you stop the behavior and prevent damage to beds or injury to your dog. Here are some common reasons dogs chew. Dogs are clever, curious animals, and bored dogs may begin to destroy in order to find a problem to solve. This may mean that the more chew resistant dog bed you provide, the more your dog will want to figure out how to destroy it. 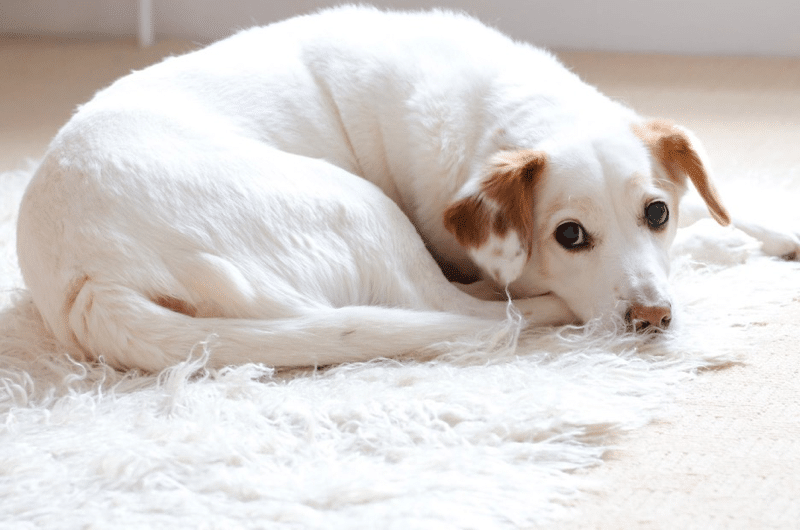 Providing a chew deterrent dog bed is an important step in solving this problem, but it is also important to address your dog’s boredom. Giving your dog puzzle food toys and plenty of complex chew toys can satisfy her curiosity and keep her entertained. Plenty of exercise and mental stimulation before crate time can also encourage energetic, intelligent dogs to sleep instead of destroying. Some dogs, especially dogs with high prey drive, may enjoy ripping up their bedding because it satisfies a desire to attack prey. A chew deterrent dog bed without stuffing won’t provide the same satisfaction, and may deter dogs that rip and shred beds. Elevated dog beds are a good solution. Memory foam beds may also deter these dogs, but dogs may get through the cover before they realize that foam is boring, or they may enjoy shredding foam as well. Observe your dog carefully with a foam mattress before leaving her alone with it or play it safe with a hammock. Some dogs just like to eat things that aren’t food. Whether your dog is on a lower calorie diet than she would prefer or she is missing something in her diet, she may try to eat things that aren’t good for her, like the stuffing from beds. This can be very dangerous, as stuffing can become lodged passing through the digestive system. Addressing this issue can be difficult, especially as the stakes are your dog’s health and not just a bed. If your dog eats stuffing, have your veterinarian rule out physical or dietary reasons before trying to solve the problem yourself. Thoroughly dousing bedding with a chew deterrent may be effective. Observe your dog closely with any bed that you try for at least a month before leaving her alone with it for any time. Unfortunately, this means your dog may spend some time without a bed, but that is better than getting very sick from eating her bed. Provide food toys and safe chews, as well as healthy treats like veggies and some fruits. A variety of foods and a range of vitamins and minerals can minimize your dog’s desire to eat her bed. Dogs that feel anxious due to separation or some other trigger like thunderstorms may rip up their beds as an outlet for their anxiety. 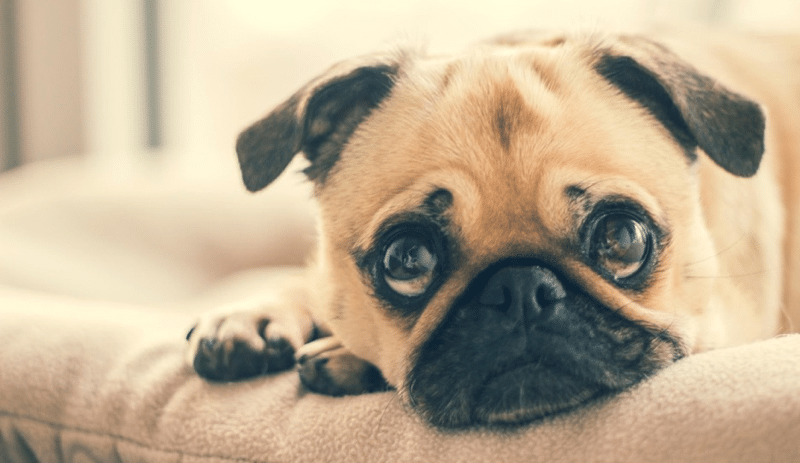 You may suspect that your dog is anxious if she makes a forlorn sound when you are gone, destroys her bedding and other things, or if you have seen anxious behavior like compulsive digging or pacing on a nanny cam. Anxious dogs can be some of the most difficult to cure. It is usually not possible to remove the source of the anxiety, and so coping mechanisms must be used. Plenty of exercise prior to being left alone can help a lot, and some dogs are relieved by thunder jackets or anxiety relieving sprays, collars, or supplements. Your veterinarian can prescribe medication for very anxious or destructive dogs. 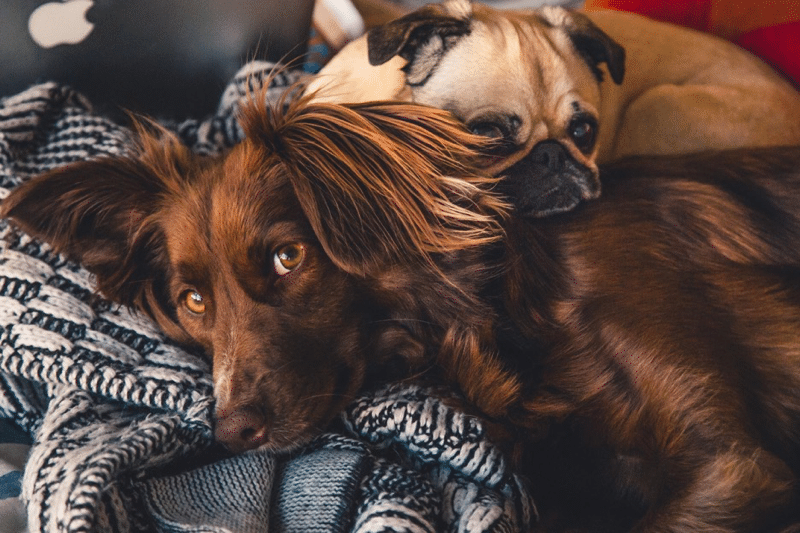 These dogs are different than bored dogs because giving them a puzzle to solve often won’t alleviate the problem, since a food puzzle or chew toy won’t necessarily provide the outlet that destruction can. The ASPCA suggests some training techniques to help your dog overcome her anxiety. 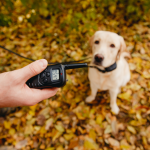 Training can be intensive and time consuming, and your dog may still need to be left alone during the course of training. Removing all bedding can be a bad idea since an anxious dog may turn her anxiety on herself in self-destruction. If your dog must be left alone in her crate and she does not eat bedding or other non-food items, it may be best to let her destroy for some time until you can find a solution for her anxiety. Cheap stuffed toys, pillows, and quilts can all replace a more expensive dog bed as outlets for destructive energy. An indestructible dog bed, paired with other outlets for destructive energy, can get you and your dog through this difficult time until she overcomes her anxiety. If your dog has destroyed a bed, there is a good chance that she will do it again. If your dog has destroyed more than one bed, you have a long road of bed replacement ahead of you unless you opt for an indestructible bed. Dogs are intelligent and determined, and no bed is truly chew proof if a dog decides she wants to destroy it. A chew resistant dog bed, along with a training program, is your best choice at successfully keeping a bed intact. 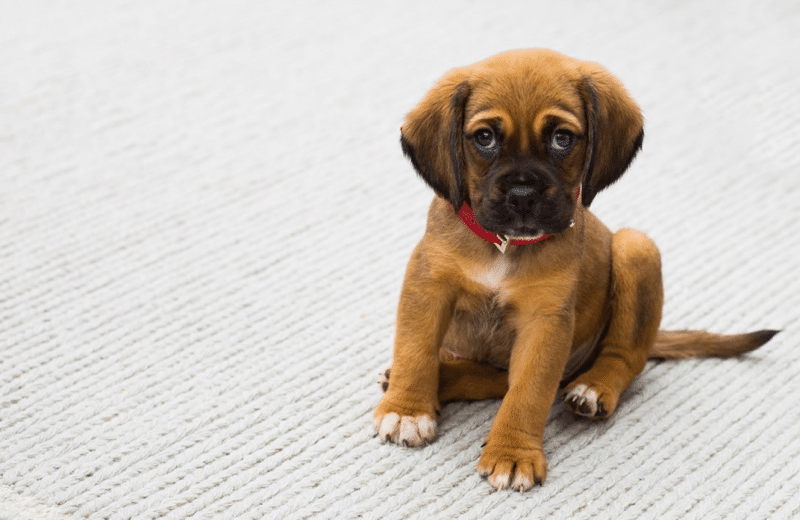 If you have a new puppy, you may have noticed her tendency to put those sharp puppy teeth on everything. 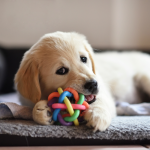 Teething puppies need to chew to relieve pressure and pain, and a variety of materials feel appealing. The chances are good that a soft pillow type bed will appeal to your puppy, who will make quick work of it. A chew proof bed can prevent your puppy from developing bad bed chewing habits and will be more likely to deter chewing, so your puppy will chew on her chew toys. A stuffingless dog bed doesn’t have a cover, stuffing, and zippers to provide interesting problems to solve. A waterproof mat that is easy to clean makes it easy for you to provide your dog with chews and food toys to occupy her mind instead. Mats are often not as comfortable as other types of beds, and can be destroyed if a dog decides to tear it. Elevated dog bed beds are the most durable dog beds. For dogs that rip and shred or like to eat bedding, elevated dog beds provide no exciting fluffing to play in while still giving support. They can be easily cleaned and so are great for dogs that need chews and food toys while they’re alone. For dogs that are not determined or persistent chewers, tough fabric may be enough to deter chewing. These are also good starter chew resistant dog beds for puppies so they won’t develop the habit of chewing. Memory foam provides orthopedic support and may not be as appealing to rip up as pillow materials. Beds that are advertised as being chew proof often have replacement guarantees for a number of days. If you are training your dog not to chew, a bed that can be replaced for free can be a great asset, as you get a second chance at training. Check whether the entire bed or only the cover is replaceable, as this makes a big difference. 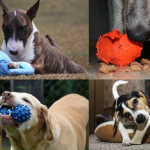 Chew toys and food dispensing toys can be a great way to encourage your dog to chew on the right things and leave the bed alone, but these toys can get messy quickly. Frozen treats can occupy even determined chewers for a long time, but they will melt and make a mess. For dogs that need entertainment in bed, a bed that can be quickly sprayed off, or a bed with a washable waterproof cover, can be the difference between convenience and daily frustration. 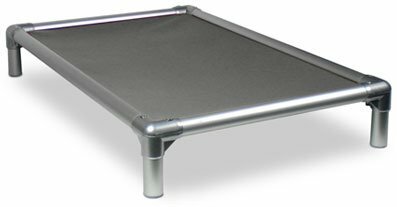 If your dog is heavier (up to 250 pounds) or an extremely intense chewer, the Kuranda Aluminum Dog Bed is the right choice for you. This is also a good elevated dog bed if you have two or three dogs who enjoy sleeping together. The aircraft grade aluminum can resist even the most determined chewing. It is also a chew proof bed that is suitable for indoor or outdoor use, perfect for outdoor kennels, pool areas, and porches. Four attractive colors in the heavy duty 40oz solid vinyl let you customize the look of this bed to your decor. This bed is easy to clean and stands up to repeated cleaning. Don’t worry about letting your dog enjoy her bone or chew toy on her bed. She can drool and lick all she likes, and all you have to do is spray down the hammock or clean with soap and water and let it dry. This bed is low enough that even dogs with mobility challenges or anxiety about climbing into a bed can get into it, but it is able to resist even determined chewers. The K9 Ballistics Chew Proof Aluminum Cujo Cot has a chew proof rating of 5/5, so you know it can handle even the most persistent chewers. The 1680 Denier Ripstop Ballistic Nylon cover can resist whatever scratching or chewing your dog throws at it, as well as repelling dirt, hair, odors, and water. You can easily wipe or hose down this bed, or even machine wash the cover. This elevated dog bed is great for indoor and outdoor use and fits crates well too. Assembly is easy and the 100% aluminum parts are durable and chew resistant. This bed is covered under a 120-day chew proof guarantee so that if your dog damages the bed the damage will be replaced free of charge. 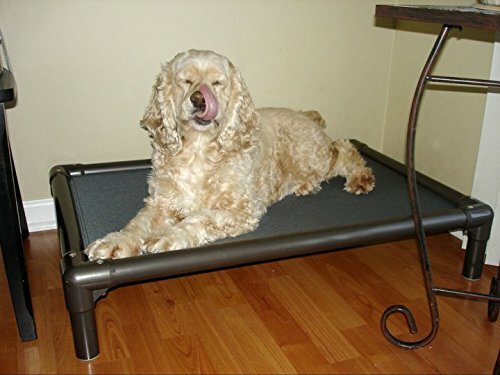 Dogs chew on fabrics they find appealing, and the Kuranda Standard Dog Bed is not made of materials that most dogs find appealing. 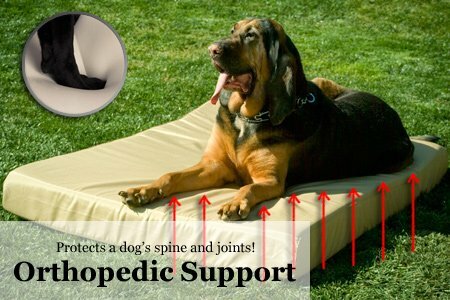 It is, however, made of high quality materials that your dog will love to lie on. A higher elevated bed like this one is better for larger, heavier dogs, since it lets their weight sag without resting on the ground. The entire hammock surface is consistent mesh, making this good for big dogs that like to sprawl out. Legs can stick off comfortably while vulnerable joints are supported and comforted. High strength PVC can sturdily support up to 100 pounds. This bed is easy to clean no matter how messy your dog is. The elevated design keeps your dog comfortable and dry even if she has an accident in her kennel or spills her water bowl near her bed. The cordura fabric is abrasion resistant and as durable as canvas. It provides good traction for dogs who may feel nervous getting in or out of the bed or who are unsure on their feet. The K&H Original Pet Cot Elevated Pet Bed is a great, affordable choice for medium sized and smaller dogs who are hard on their beds. The 600 Denier fabric is soft and comfortable to your smaller dog’s delicate frame, but is water resistant in case of spills or accidents. The mesh center will keep your dog cool, while the lining can help nervous dogs overcome anxiety about stepping into the hammock. 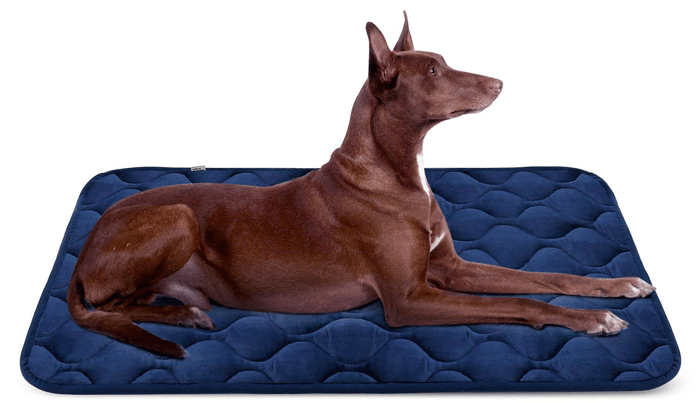 Non-skid rubber feet ensure that this bed won’t slide around when your dog gets in. A one-year warranty can make you feel confident about trying the bed out. The fabric part of this bed comes in three colors so you can customize with your decor. This elevated bed is easy to assemble and disassemble, so you can take it with you on trips or move it inside or outside with ease. This hammock bed isn’t as durable as more expensive beds, so if you have a very large or determined chewer you may want to invest more in a bed that is more likely to last. 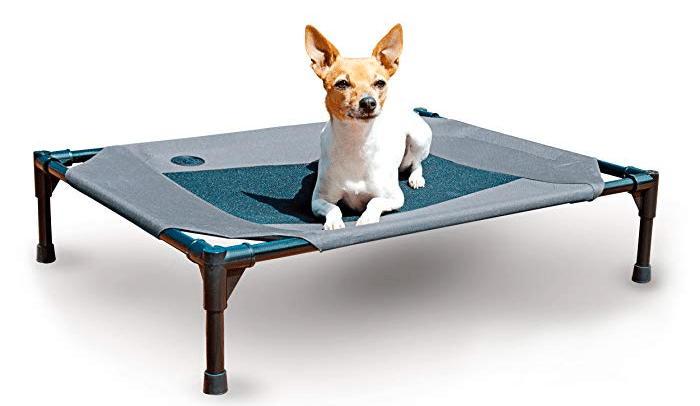 If, however, convenience and comfort are foremost in your mind for your small or medium size dog and you think a hammock style bed might deter chewing but you don’t want to spend a fortune, this may be the perfect bed for your dog. Some dogs like to rip at stuffing, so a stuffingless mat bed deters chewing. This Multi-function Soft Fleece Crate Dog Bed by Hero Dog offers orthopedic support and is a good choice for dogs who don’t want to climb into a hammock but will destroy memory foam or pillow beds. The durable plush fleece is very soft but not easily bitten or scratched. This fabric deters fur from sticking to it, and is low maintenance as well as durable. The thick cotton inside relieves pressure points and makes for a comfortable bed inside of crates. An anti-slip, non-skid bottom keeps the mat from moving around in the crate or on your hard floors. You can wash this entire stuffingless dog bed, and it will keep its shape even after multiple washing cycles. The low clearance of this mat won’t take up too much room in the crate. This bed can be ripped up by very determined chewers, so it is best for deterring chewing in young dogs or for dogs who give up easily. If your dog sometimes tends to chew but is not a determined chewer, the K9 Ballistics Tough Orthopedic Memory Foam Dog Bed is an extremely comfortable option for her. This chew deterrent dog bed has a chew proof rating of 4/5, which is good for light or moderate chewers. The durable Ripstop ballistic material deters dogs from scratching and chewing while also being resistant to odors, water, dirt, and hair. You can easily wipe down this bed or it can be machine washed. This five-inches thick bed offers excellent orthopedic support, perfect for older dogs or those with joint problems. This bed is guaranteed against flattening for 10 years, so if your dog doesn’t chew you can have this bed for most of her life. If your dog does chew within 90 days, you can get a new cover free of charge. This won’t be any help if your dog has chewed into the memory foam, so only choose this bed if your dog isn’t a heavy chewer. If you are unsure, be careful to watch your dog for some time with the bed and don’t leave her alone with it. Comfortable orthopedic memory foam is great for older dogs and dogs with joint concerns. Chew proof rating of 4/5 good for light or moderate chewers. Machine washable or wipe down cover. Guaranteed against flattening for ten years. Cover will be replaced if chewed in first 90 days. You’ve spent more money than you’re comfortable with on a fancy new chew proof bed for your destructive dog and she hates it. What could be more frustrating? Chew proof beds are often not as immediately appealing as the plusher beds they replace, although they may be better for long term orthopedic support. So how do you convince your dog to try out her bed? If you have an elevated hammock bed and hard floors, your dog may feel nervous about climbing from the slippery floor up onto the bed. 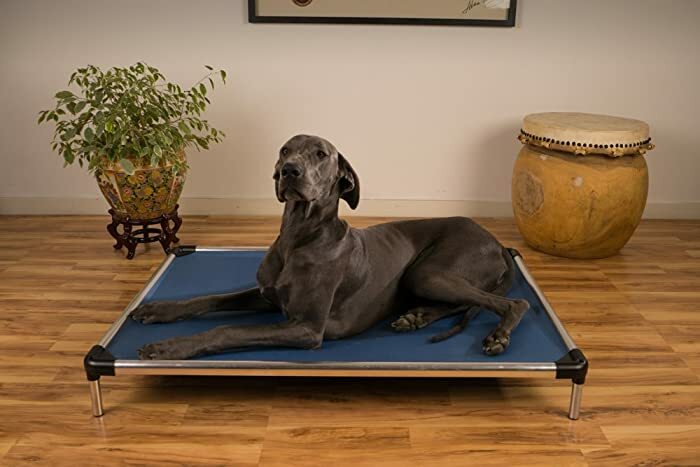 Lay a gripping mat or rug around the bed so your dog can climb in easily. Beds with less plush fabrics can be covered with a blanket at first. Watch your dog carefully to make sure she doesn’t rip up the blanket. Try removing the blanket after your dog is becoming comfortable. Hopefully by the time you leave your dog she will be content without the blanket. Once you have the most chew resistant dog bed that you can get, there are several other important things you can do to prevent chewing. Chew deterrent sprays can be used to make the bed taste bad to your dog. Be careful to watch your dog’s reaction, as some dogs like some sprays. Make sure you choose a spray that has deterrent taste and not smell so that it doesn’t chase your dog away from the bed. The best training routine to teach your dog not to chew her bed is a consistent observation and replacement strategy. 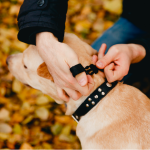 Watch your dog carefully when she is on her bed, and if she begins to show interest in chewing the bed, redirect her attention to an approved chew object like a food or chew toy. 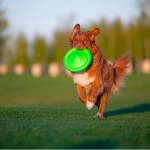 It may take a long time to teach your dog, and there will likely be setbacks. The more resilient and chew deterrent the bed, the better your chances of success. A bed chewing habit can be very frustrating for a dog’s human family, but there is no reason to feel overwhelmed. There are techniques and products available to help your dog overcome this common bad habit. With understanding of the reasons your dog destroys her bed, patient training, and the right chew proof dog bed, your dog will be sleeping comfortably instead of destroying her bed. Buying an indestructible extra large dog bed would be good for my dog so that she will chew on approved chew items. I think she’s bored most of the time and doesn’t have a good place to sleep on. It’s good that you said that she could be missing something in her diet as well so I’ll make sure to feed her well and buy her a good dog bed online so she won’t be bored and become comfortable in her new home.